This interactive course provides an in-depth analysis of the cognitive, affective and motivational aspects of self-control, and delves into the relationship between media use and self-control. Why are videogames fun? The answer isn't as obvious as you might think. Good games draw you in, teach you how to succeed, and keep you engaged with a "just right" level of challenge. Most importantly, players *learn* while playing a well-designed game. Why isn't school like that? This class takes a hard look at videogames, a hard look at education, and considers ways that each can be improved to maximize learning. This seminar revolves around Place Out Of Time (POOT), a web-based character-playing simulation involving college, high school, and middle school students. You will have a dual role in the simulation: you will play a character yourself, and you will also act as a project leader and mentor to the younger participants. The idea is to help the students to construct a bridge between historical times and the present day, to gain a heightened appreciation for other worldviews, and to wrestle with some (hopefully) interesting questions in a way that will deepen our learning about history…and about ourselves. 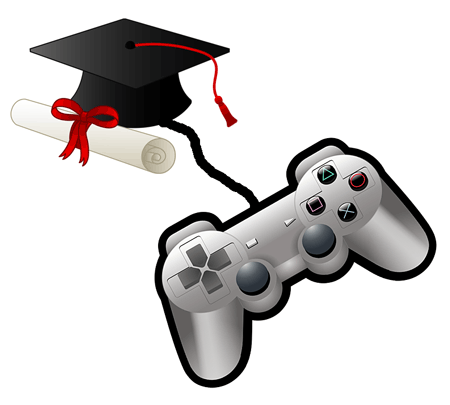 Introduces students to the theory and practice of simulation, metaphorical, and literal games; provides extensive exposure to gaming used as a vehicle of instruction in various parts of school curricula; provides opportunities to design games for classroom use, with some attention to problems of evaluation. Concepts and methods for the design and development of computer games. Topics include: history of games, 2D graphics and animation, sprites, 3D animation, binary space partition trees, software engineering, game design, interactive fiction, user interfaces, artificial intelligence, game SDK’s, networking, multi-player games, game development environments, commercialization of software. This class will focus on varied experiments with the novel as a form uniquely suited to explore America’s animating myths and ideals. We’ll also work with other materials—films, visual images, and VR games/environments—that will help us account for the life of the novel in the US. This class will examine both representations of gender identity and the lived experiences of gender identity online. During the early history of the Internet, gender play and experimentation were practiced in many ways, from games to seemingly non-fictional self-representations. By using gender as a lens, this course will seek to understand how gender and identity are performed together, whether to play a role or to function in society. In this course, we will complicate and critique these depictions of Islam and Muslims by examining representations of Islam by Muslims and individuals from the Islamic world across diverse forms of contemporary cultural expression and consider the impact that more diverse representation can have on a local and global scale. We’ll examine works across media including the visual arts, film, literature, graphic novels, and even video games. Play is an essential aspect of early childhood learning and development. Called “the work of childhood” research has demonstrated the importance of play—linking play with language, motor, cognitive, and social development. This course will explore many aspects of play including the history of play, play cross-culturally, how play is influenced by privilege and diversity, and play as intervention. In this class we will explore the experimental, technological, and highly creative world of Digital Storytelling. Digital Storytelling is a genre which contains many forms of multi-media based literature, from hypertext (links within a story/poem that transport you to other connected stories), to merging video, sound, photography, and language in a digital space. Other forms of electronic literature engage the viewer/reader through online textual games, the use of sound to control the words on the screen, and even movements of the body to interact with text.